Suburban Pond resembles a small world in whichboils its own special life: develop and bloom plants scurry underwater inhabitants, every day there is something new. To provide a reservoir of life it should be cleaned at least once in a while one of the conventional methods - using a skimmer, vacuum cleaner, pumping station or a home-made device. 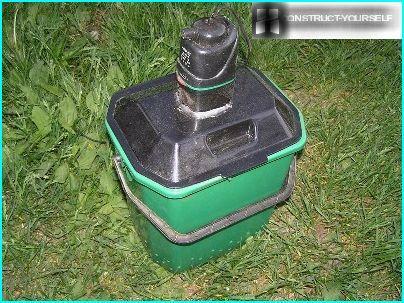 For gentle cleaning of the water from the sludge to collect enough filter for the pond with their own hands and connect it to the mains. Does it even need a pond filter? 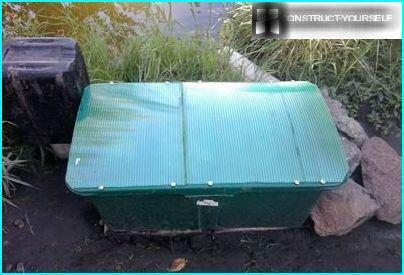 There are several conflicting opinions aboutyou need to install in a pond extra cleaning device. Proponents of natural cleansing believe that filter natural body of water does not make sense, because inside it is all provided by nature. 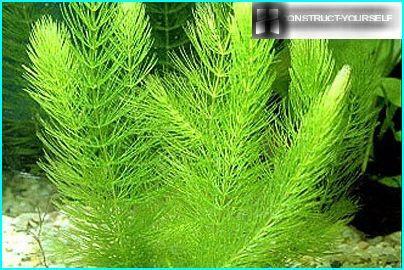 For small-area water bodies suitable Urutpigweed and Bog autumn, for larger ponds - waterweed and hornwort. Representatives of underwater fauna are also a kind of cleaners. For example, cancers and Cupids feed on duckweed and other polluting algae. The reservoirs created by artificial means tofilm material is often used biological treatment means comprising cleaning bacteria. 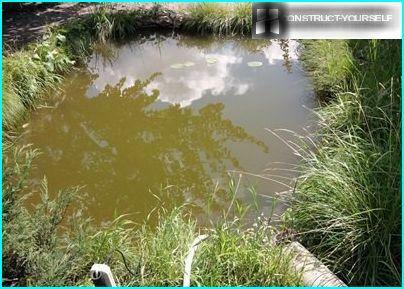 They kill algae, but are not suitable for ponds where fish are bred. One of benign solutions - the use of mixtures of peat, which makes the water less rigid and prevent the development of algae. Many believe that without human intervention is notdo. Be sure to clean the surface of the water with dry twigs and grass, fallen leaves and other debris. 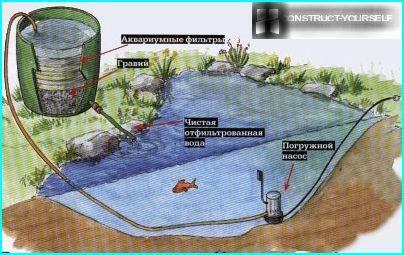 If the water is too turbid and contaminated, it is necessary to use special pumping stations that will cost very expensive, or home-made device, which is much cheaper and more accessible. 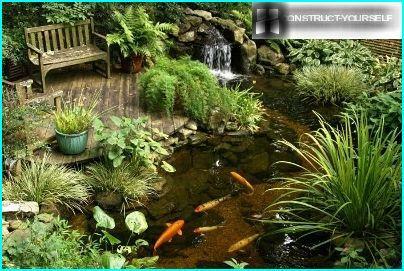 Consider two options for home-made garden pond filters, which can be done quickly and inexpensively. What are the only things do not fit dexterousgardeners for their inventions! The suit any tank with holes into which you can put the filter components as a container for the filter. Homemade fine filter has proven itself during the cleaning of the pond with the size of the mirror 2.5 meters x 3.5 meters. hose of polyvinyl chloride (1 m). Many of these materials can notdifficult to find in the country, others are sold in building supermarkets. Pump Atman AT-200 series have a chance to buy at the store, "Everything for the aquarium." Pump perfectly clean water and at the same time enriching it with oxygen. To adjust the power supplied several devices. Submersible motor running safe and has a low noise level. 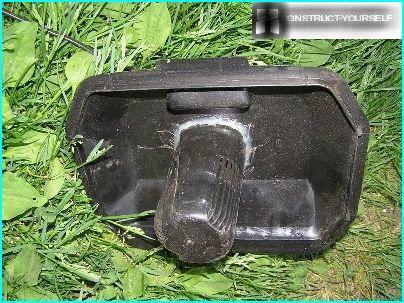 The device operates on 220V, has a 38W power. For a small unit has a reasonable performance - 2000 l / h. Perfect for the waters to a depth of 2 meters. 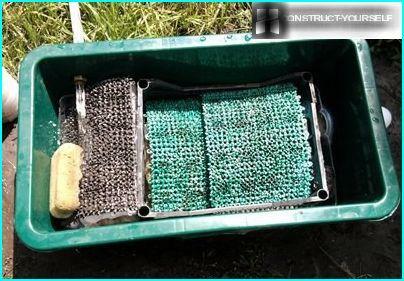 As the filter components can beuse of any material absorbing or retaining dirt: expanded clay, packed in agrovoloknom; foam mats, twisted rolls; plastic mats with holes; old washcloths. All these layers is loaded into the container (basket), and then attached via a sealant and a siphon hose. The pump is immersed in water and is connected to the network. For safety reasons, the socket should be packed in a waterproof casing. Overflow do not necessarily - in the case of contamination of the filter the water naturally overflows and goes down the drain. Second homemade pond filter isa submersible device to be installed at the bottom of the reservoir. 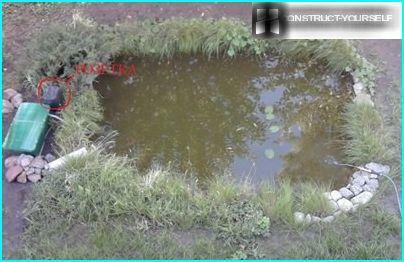 The volume of the pond - about 5 m depth ?, -. 1 m can be any design, but the selected option - the cheapest and most functional, factory-like filters, which are sold in the store. 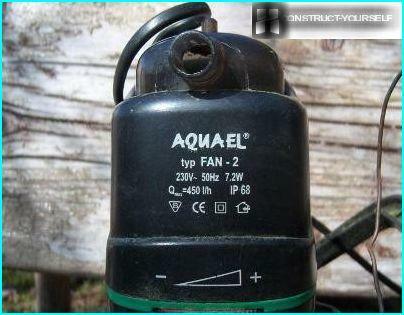 Anyone who is engaged in or at least interested inaquariums, known for several popular models of pumps. One of the most successful - the Polish unit AQUAEL FAN 2. Advantages of the machine lie in its technical characteristics: reliability, creating the desired flow, excellent flow and atomizing air. 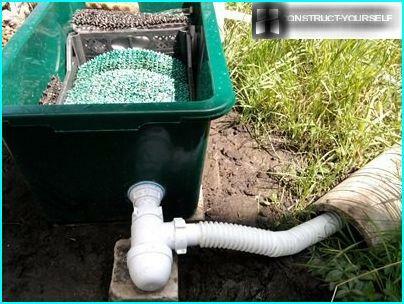 You will need a plastic bucket with a capacity of 10 liters,plays a role in the body of the filter element. It is desirable that the plastic be relatively durable and withstand a load of 15 kg. The decorative coloring for "underwater" bucket must match the color of the bottom, that is to be brown, gray or black. For full operation requiredsmall refinement. 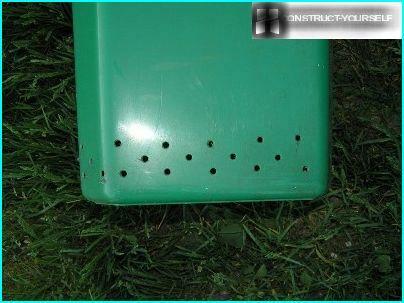 The sidewalls of the bucket, drill small diameter holes (4-5 mm) - they will flow to the water purification. 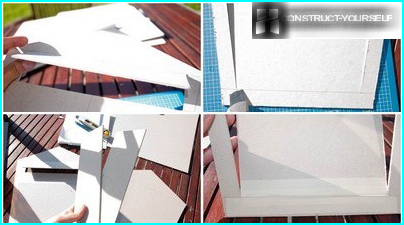 Some types of plastic brittle, so you need to drill very carefully. The cover should be cut large hole to secure the filter in it. Also, it takes a little ventilation air to enter - another hole in the lid, but malenkoe- 3 mm. In an ideal filter materialsuitable foam - it perfectly absorbs moisture and retains the dirt and easy to clean. The optimum thickness of layers - 50 mm, but can be applied to a different format. Foam mats are used several times. We fix the filter housing to the pump cover, using a sealant or a hot melt adhesive. Attach the pump housing on the cover. We put foam mats along the walls of the bucket. At the bottom we put two or three stones with a total weight of 5 kg - as a weighting agent. 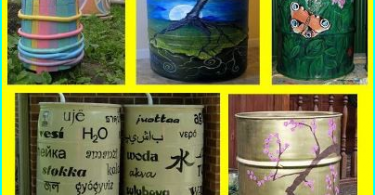 Fill the remaining space with foam rubber buckets. Fix the cover using wire or clamps. For operation, the device must be connected tomains of 220 V. The connection plugs and sockets must be protected from any moisture. You can use the cover of moisture repellent material. RCD installed on the line, work with current leakage and disconnects the network. To install the filter bottom to select a smooth portion, preferably in a high place. Drop a filter into the water, after which it naturally sink to the bottom of the reservoir. Then connect the power supply and equip the place leaving water after cleaning. For aeration pump should be connected to a thin tube, which second end is over the water surface. There are many modifications of the self-made filters for cleaning of the pond, and to increase the productivity of each craftsman can bring something of their own, functional and useful.